With the recent announcement of 2040 petrol and diesel car ban across the UK, London stands at the greatest advantage point when it will come to leaving the exhaust bearing vehicles behind. The capital already has 800+ electric car charging points installed across the city (in case you do choose to drive) and with the help of the most extensive public transport links in the country, plus the recent boom in cycle lanes development, Londoners can expect to be welcoming such changes with greater ease than let’s say those living in more rural areas of the country, where transport links are poor to nonexistent. Depending on the area of London, a variety of approaches to transportation may be taken. For example the borough of Hackney likes to pride itself as the greenest London council, it is estimated that the least number of people own cars here. This is mainly due to the demographics of the area – a large number of residents living in the leafy borough are young and climate conscious individuals. Number of people preferring vegetarian and/or vegan diets is also very high here in comparison to the rest of London, meaning that cycling as an addition to healthy lifestyle is often preferred here. Waltham Forest is another area that in recent years has become increasingly environmentally friendly. Walthamstow Village, also known as little Holland is located in the borough and boasts cycle only roads, allowing its residents to move around safely and quickly. Even though this is still an extremely small area, it stands as a great example to the rest of the capital of how health and environment friendly alternatives to cars can be introduced to a whole neighbourhood. Lack of public transport in an area most of the time leads to high numbers of car ownership by those who live there. However, Londoners have access to a large variety of modes of transportation, such as Underground, Overground, Buses, cheap taxis (uber) and many other train lines that also run through the city like, DLR and TFL Rail. As well as that, with many Londoners having office jobs, necessity to be physically active outside of the office hours is very high. 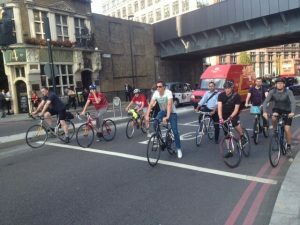 In order to get that needed amount of exercise while at the same time saving money by not going to the gym, people have an option of cycling to and from work. Many work places now offer their employees an option of entering a ‘cycle to work scheme‘, employees choosing to benefit from this scheme will be given an opportunity to purchase a bicycle and all of the safety accessories to go with it by being granted a VAT free loan by their employer, they will then be repaying the loan through monthly instalments which will be automatically taken out of their pay. Now this doesn’t necessarily mean that majority of Londoners at the moment do not hold a drivers license, what it means is that less and less Londoners feel the need to own a car or the need to use it very often while owning one. It is quite hard to imagine a city with no cars, however, a city with less cars than let’s say bicycles makes for a healthier and better place to live in. Hopefully with plans to introduce better transport links across the country, other big cities will follow.